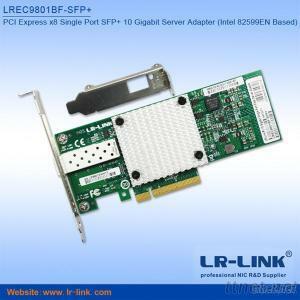 LR-LINK LREC9801BF-SFP+10G Server Network Adapters with SFP+ connectivity are the most flexible and scalable ethernet adapters to meet the demands of today’s data center environments. Data center networks are being pushed to their limits. The escalating deployments of servers with multi-core processors and demanding applications such as High Performance Computing (HPC), database clusters, and video-on-demand are driving the need for 10 Gigabit connections. Customers require flexible and scalable I/O solutions to meet the rigorous requirements of running mission-critical applications in virtualized and unified storage environments.